Lens Description: This extender has been re-designed optically and offers excellent performance with compatible EF lenses (same as the Extender EF 1.4x II). Features a new seven-element design, and same weather-resistant design and anti-reflection internal construction as the new EF 1.4x II. 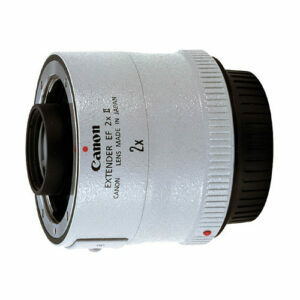 The EF 2x II doubles the focal length of any lens it\'s mounted to, and reduces its effective aperture by two stops. With the EF 2x II, AF is possible with any EOS body if the lens has an f/2.8 or faster maximum aperture, and compatible Image Stabilization lenses maintain the IS feature when used with any current EOS camera.